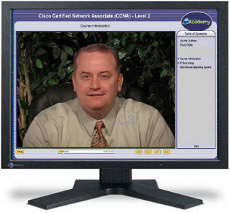 This multi-media instructor-centered CBT MCSE Exam 70-284 training program teaches students the skills and knowledge necessary to update, secure, and maintain messaging infrastructure used to store and transfer data with a Microsoft Exchange Server 2003 within medium to large messaging settings. Students learn through instructor demonstrations, video lectures, and assessments. After finishing this course, you should have the skills needed to update and maintain Exchange Server 2003. Joe Tucker - Microsoft Certified Trainer (MCSE, MCT , CTT and CCNA). Joe has instructed students in MCDBA, MCSE, and various other certification courses. He is recognized as a senior trainer and consultant with more than 8 years experience with IT training. Joe currently offers consulting and technical training services to large companies throughout the world. Our site contains authorized practice tests from MeasureUP, Microsoft's certified practice examination administrator, so you can properly study for certification examinations. Since numerous companies provide practice tests and training, the Microsoft MCP program developed MeasureUp to assist IT students choose the best services and products. Microsoft reviews every practice test provider, and only vendors that develop approved tests get Microsoft's Certified Practice Test Provider symbol placed on their products. This course offers interactive labs, making it possible for students to obtain hands-on learning. This setting enables you to use the software without buying it or installing it on a computer.